The strategy is suffering drawdown since the beginning of May. The strategy is performing better than the darwin because of the settings of the risk manager before and after brexit. The profit made at the beginning of July unfortunatelly hasn't been replicated by the darwin. Stagnation of the strategy ended after 196 days. This result is consistent with backtests. Thanx to my investors that remained with me during these frustrating months! To endure a sound strategy is never easy. Let's continue our journey with discipline and confidence! @CavaliereVerde - congrats on a record-breaking November on LSC - brilliant. This is trendfollowing: 80% of the profit is made in 20% of the time. Congrats for winning the first prize! @CavaliereVerde, well done! This is what i like to see on traders , average winning/losing position and average winning/losing trade. It shows that you have a very good risk management take place. Congrats! Also I like to see traders with a performance of 10 like you! Speaking of average win/loss I found that it works for trendtrading. as you can see in my other system KVL. Interesting point. If so, I will need to revise my portfolio selection strategy. I guess I may need to use different sets of filters depending on the type of strategy I am looking for. I would like a mix of different types of strategy to increase diversification; as different strategies tend to perform better or worse depending on market cycles. I think your way of splitting different strategies into separate Darwins helps a lot with this as it will mean I am comparing like with like when using a particular set of filters. ... and that will be my idea for a "discretionary" diversified portfolio. Using timing and scalability to select different kind of traders. After some months I want to point out the damage done to my fund caused by the decision of Darwinex to reduce leverage of the Darwins before and after the Brexit. This missing high produced the connection of two different drawdowns, worsening the quality and the RAR of my darwin. Equity curves are not so different but on the long run the risk manager is worsening my performance, despite a stable risk profile and a good Risk Management score. This is why I am waiting for a better risk manager and for new darwins. I am a little disappointed for this big drawdown of January and February. Increasing the robustness of some parameter sets that were optimized on a too small sample of trades. Introducing some mean reverting strategies running on m15, these are running with very small sizes but forward results are very encouraging. some pairs seems to go anywhere in the last month. Enduring moments like this show your perseverance and discipline, you are doing a great ALGO JOB. BTW. humble opinion, Pure LongTerm T.F. strategies are like this, in those periods you loss but when you are in healthy Trends also some TPs could overtakes large parts of losses . Look Forward for Good Trends . After two weeks of Reloaded I can state that I am very satisfied with the reloaded LSC. I know that past is a model but there is no more deterioration of run ups and the "afterbrexit" profit is back at its right place on the equity curve of the darwin. No more adjusted positions with a system that has Risk Stability as a flag. I am satisfied also of my work concerning the tweaks done 2 months ago, parameters seem to be more robust and in sync with the markets. Is this an aberration of the platform or is it consistent with your trading account? 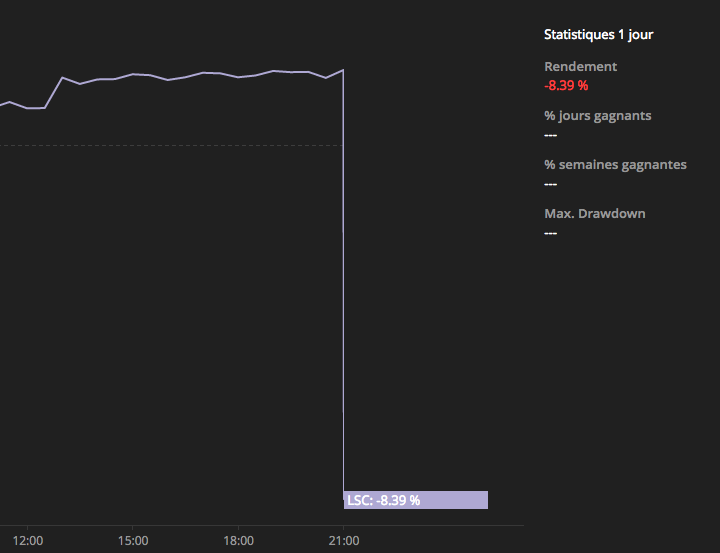 The return from origin is 28% as usual, I think it is a bug caused by WE.